This small light stands on the north east shore of the narrows known as the Oxdjupet Channel. 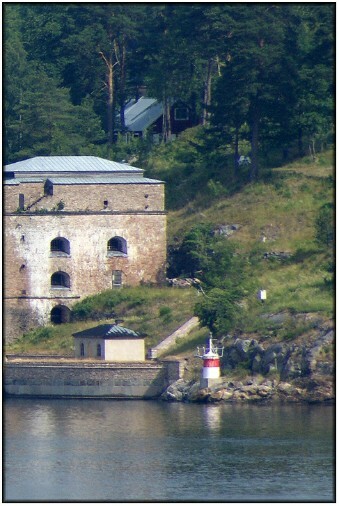 The large blockhouse affair in the right of shot here is a detached bastion of the great fortress of Oskar-Fredriksborg that lies on the opposite side of the narrows. This is antoher light of the type that looks like a small lantern with a post light built on top of it. I have no dates for any of these lights, but this particular type appears to be fairly modern. It is not listed in the Lighthouse Directory and the details are taken from the National Geospatial-Intelligence Agency, Publication 116, List Of Lights Radio Aids And Fog Signals. 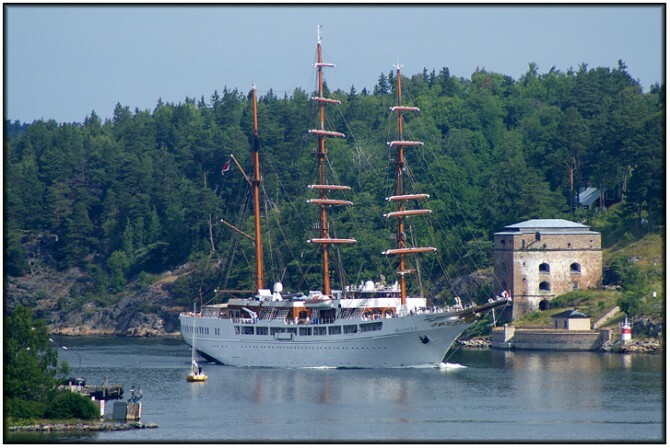 The image below gives a wider view of the site with the modern sailing ship Sea Cloud II transiting the narrows.